Anti-incumbency along with price rise (I prefer it over the word 'inflation') led to Congress defeat in Uttarakhand and Punjab. In Uttarakhand (earlier Uttaranchal), the state government looked ineffective. Elderly ND Tiwari, who was once the Chief Minister of undivided Uttar Pradesh, seemed to be biding his time. Unemployment became a big issue. In Punjab, the high turnout of women signalled the public anger over the rising prices. The Saffron sweep has come at a time when the elections in UP are round the corner. In Uttarakhand, Muslims form a substantial population but are not concentrated in any region except Haridwar. The fact that all the three Muslim MLAs who won in Uttarakhand are from Bahujan Samaj Party, will truly give nightmares to Samajwadi Party. Qazi Nizamuddin, Shehzad and Haji Taslim Ahmed won from Manglor, Bahadurabad and Laldhang respectively. With 8 MLAs in the house of 70, BSP has shown its strength in a state where Dalits don't have a large population. And not a single Samajwadi Party candidate could win. Uma Bharti's Bharatiya Jan Shakti also failed to open its account. In Punjab, the lone Muslim legislator came from Maler Kotla, the only town with Muslim population that had survived partition. Razia Sultana of Congress defeated Akali Dal's Abdul Ghaffar by 14,000 votes. She was jittery when at a function, a Muslim police officer (IG) had set afire the Ravana effigy four months back, causing a controversy. In Manipur, Alauddin (Congress) and Helaluddin Khan (RJD) won from Keiro and Lilang seats. Here Congress is likely to form the government with CPI's suppport. Interestingly, the train goes to Ahmedabad, which the BJP government has been wishing to change to Karnavati. Through the pronounciation Amdavad and Amdavadi the Muslim-ness in the name has been reduced though, lately. 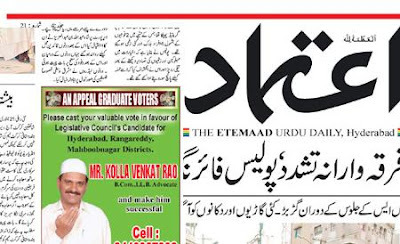 An Urdu daily with the same name (Azimabad Express) is published from Patna for long time. Also, a controversy over Jawaharlal Nehru University Registrar being caught by students and not allowed to offer namaz, has led to a controversy. For seven hours Owais Ahmad was kept besieged by DSU, SFI and AISA (leftist union) students. Newspaper reports mention the ordeal he went through. Later the senior leaders of leftist unions also regretted the incident. Congress leader AF Goman Osmani who is a member of parliament from Assam created a scene onboard Rajdhani Express. He was absolutely drunk and created such a ruckus that families in compartment had to be shifted elsewhere. The MP from Barpeta, who had earlier floated the United Muslim Front (UMF), allegedly shed his clothes and moved from one corner to other in the bogey. Watching Osmani on ETV, I felt disgusted. He had the entire drinking paraphernalia around his berth and was totally out of his senses. The passengers said that despite their complaints, no action was taken against him. They rued that the 'leader' even danced in that state. When the reporters of Sahara and ETV woke him up, Osmani's expressions and his speech were 'worth seeing'. 75-years-old AF Ghulam Osmani is a lawyer by profession who has studied at Dacca University, Calcutta and London. This is not a first though and we have seen scores of such incidents of misbeheaviour by politicians during railway journey. Unfortunately law is applied selectively for ordinary people and politicians. When a person is caught with a suspicious object in travel, he can be put to endless harassment but a politician Mahesh Joshi was caught with gun and dozens of live cartridges but he was simply let off. (This is not a comprehensive list or directory. Once into this world you can yourself sail find hundreds of interesting Islamic weblogs through blogrolls and links. Just see the number of Muslimahs (Muslim women) who are blogging. The list above probably has more Muslim women than Men.) There are hundreds of Muslim bloggers across the globe and it is impossible to feature them all. Above are a few of Muslim bloggers from Middle-East (Arab world), Asia, Australia, America, Europe and Africa(!). Professor Iqbal Husain Khan has taken charge as the first Vice-Chancellor of the ambitious Muhammad Ali Jauhar University Rampur. Khan resigned from a Chicago University to join the Jauhar University. He has been associated with Aligarh Muslim University and Jamia Millia Islamia in the past. The building of the Muhammad Ali Jauhar University is under construction. The session would start from July 2007. It has been the project of Samajwadi Party leader Azam Khan, who had a confrontation with Governor over the establishment of the university. The Engineering College is under-construction at the cost of Rs 15 crore and the building is near-completion. The foundation for hostel has been laid as well. Apart from Engineering, some other courses including law classes would start from July and preparations are in full swing for the same. Mohammad Ali Jauhar University would be the first major Muslim university to come up in North India after independence. Nearly a 1000 workers are busy in the construction work. A mosque, Masjid-e-Umar that will have space for 7000 persons to pray simultaneously is also being constructed. Muslim populace in Uttar Pradesh and many business houses have generoulsy contributed for the fund. Initially, there was scepticism about the project but if the University begins to function, Azam Khan is surely going to gain clout. It was a tough decision to make. But Adnan Farrukh Shah alias Miyan Sahab, decided to break the tradition of the Tazia procession that was taken out in Gorakhpur for the past 303 years without any interruption. 'At a time when political parties were out to draw mileage from the anarchy prevailing inthe region, his is the voice of peace and sanity--something which saved Gorakhpur from burning', writes Rajesh Kumar Singh, in Hindustan Times, Lucknow edition. 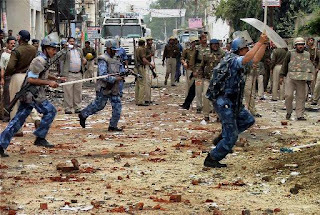 As the activists of Hindu Yuva Vahini (HYV) targeted the establishments of the minority community, it seemed the whole region would soon be engulfed in bloody clashes between the two communities. The Muslim community was preparing to take out the ninth and tenth Moharrum procession, giving the district administration officials sleepless nights on what could be in store, the story further says. They did not know how to manage the processions as the route passed through some Hindu dominated areas.In this hour of crisis, Mian Sahab emerged as a saviour. He assured the district administration officials that the Muslim community would not take out the ninth and tenth Muharrum procession despite the fact that administration had permitted the processions. It was a difficult task to convince the religious leaders and members of the community, but the voice of Mian Sahab prevailed. It was decided that all the tazias would be buried in Karbala after restoration of normalcy. Following in the footsteps of Mian Sahab, the religious heads of neighbouring Kushinagar district too decided to call off the procession. "My family has been leading the Muharrum procession for 303 years now and for the first time in he history of Purvanchal region the tazias were not buried on Ashuraa," he said. Now that Shiv Sena has taken a lead along with its coalition partner over Congress, NCP and other parties, Muslims in Mumbai would surely be in a reflective mood. A big section of Muslims would be happy that 'Congress-NCP ka ghuroor, ho gaya chakna-choor'. Such headline we might see in Urdu newspapers on Saturday. The manner in which Congress government treated Muslims, the majority of Muslim populace was angry. The midnight swoops and searches, arrests and allegedly biased manner in which Muslims were targeted after Mumbai and Malegaon blasts while the Bajrang Dal activists were allowed to go scot-free, had turned Muslims bitter. Till last minute it appeared that Muslim vote would be divided. Most were unwilling to vote for Congress as they wanted to teach it a lesson [how many times!]. Some may have changed mind after Thackeray's statements against Islam just a few days back. 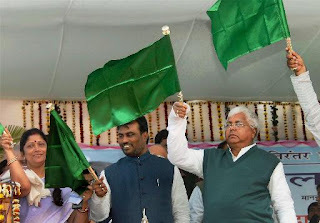 However, the so-called third front comrising Samajwadi Party, RPI and other small parties, got lot of Muslim votes. This is evident with the win of SP in half-a-dozen constituencies by afternoon, as per trends. There may be the feeling that Shiv Sena is a known enemy so it's better to have such a party than Congress, which always 'stabs in the back'. But, Muslims, must realise that they can't be hostage to any political party. They are neither slaves of Congress, nor they need to be afraid of Sena. All parties are equal in this game of stoking communal fire and from Bhagalpur to Gujarat and Bhiwandi, Congress and BJP/Shiv Sena are no different when it comes to communal riots. Yes, the difference may be in rhetoric. Bal Thackeray speaks unlike Congress-walas who are sophisticated but plan something that hurts more deeply like not letting Muslims get into jobs etc etc. Wouldn't it have been better if Muslims had directly spoken to Shiv Sena-BJP and bargained for something when they really wanted to defeat Congress! Time is not lost. In the next election Muslims can surely do it. I am no fan of BJP-Shiv Sena. But Maharashtra Congress has failed Muslims badly. It doesn't implement the Sri Krishna Commission Report. Why not play the game as per rules of the game. When we have to vote, we should do that judiciously. Congressmen are no saints. The 1993 riots did not occur just because of Shiv Sena-BJP but because of the then Congress Chief Minister Sudhakar Rao Naik, who ensured that the police did not intervene and side with the goons. Let's bargain and vote overwhelmingly for the one who promises to at least listen to us. It is not that the Mumbai residents have voted for Shiv Sena and its anti-Muslim plank. It is the clear division of Muslim votes and lack of tactical voting coupled with the failure of NCP and Congress to do a tie-up, which has resulted in this fractured mandate. And Muslims knew this would happen but their lack of any strategy has made it look like a 'victory for the anti-Muslim forces' and the 23 lakh Muslims are now sitting on the fence. Haven't Muslim made a fool of themselves when they could have been the king-makers. Rashid Kausar Faruqi is a well-known name in Urdu literature. Those interested in Urdu, especially classical Urdu poetry, would appreciate his ghazals. Read the entire ghazal at Urdu India. Click.